Have a few doubts or simply wish to satisfy your curiosity? Take a look at our presentations which contain answers to many frequently asked questions and tips on how to run your promotions. 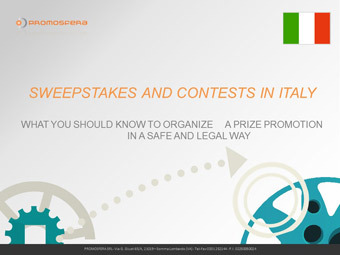 International prize promotions – How to…? 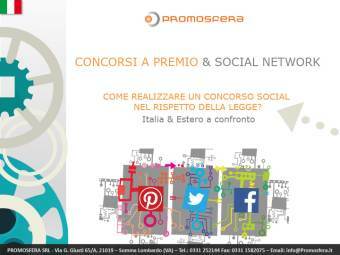 Concorsi a premi internazionali - Come fare? 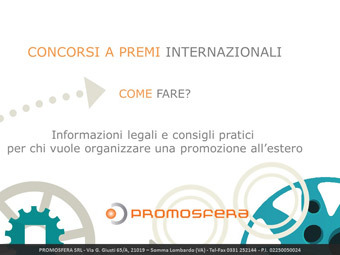 Informazioni legali e consigli pratici per chi vuole organizzare una promozione all’estero. 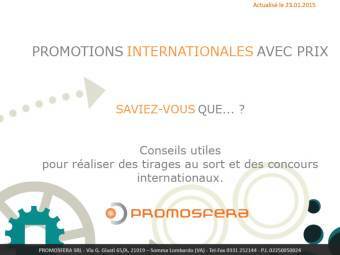 Promotions internationales avec prix – Savez vous que…? Conseils utiles pour réaliser des tirages au sort et des concours internationaux. 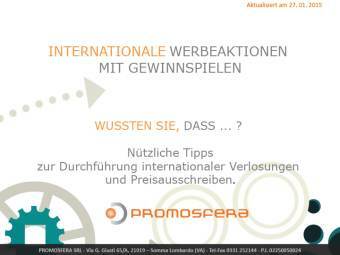 Internationale werbeaktionen mit gewinnspielen – Wussten sie, dass…? Nützliche tipps zur durchführung internationaler verlosungen und preisausschreiben. Promociones internacionales con premio - ¿Sabias que...? Consejos útiles para llevar a cabo sorteos y concursos internacionales.